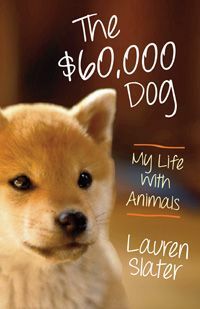 In the passionately written book, The $60,000 Dog, Lauren Slater explains the reasoning behind her intense affection towards animals in her life. Slater describes her nostalgic, troubling past, and how her discovery of her passion for animals helped her realize her true character. One could say that this book is bittersweet. Reading the author’s haunting past with her lack of nurture from her morose mother and her found ways of escape from a new foster family she must live with makes Slater’s autobiography a feel-good, yet heartbreaking kind of writing. Slater describes her new life with her husband, Benjamin, whose feelings toward animals are rather opposite of Lauren’s, and her two adopted dogs that she falls unconditionally attached to. Lauren Slater’s deep attachment causes her to take extreme measures to save one of her adopted dogs, Lila, who goes blind, and whose medical expenses begin to cost Lauren and her husband $60,000, hence the name of the book. Other expenses cross Slater’s life such as her horse’s dental concerns and their special needs of individual toothbrushes and paste for a twice a day brushing. I find one of the most beautiful parts of this book is how Slater’s love for animals passes down through her children and how she appears to fall in love with her daughter’s love for animals as well. Though I feel this book is a bit unnecessarily detailed, I would recommend it to readers because Slater’s outlook of animals is clearly just as strong as one of another person (as her children and husband), which is a rare trait that Lauren Slater reveals proudly. This book is published by Beacon Press.